Colonial House. 17th Century life. Video. Daniel Boone and The Westward Movement. Video. Australian Survival and Preppers..: The Travois. Australian Survival and Preppers..: The Travois. : I made this travois for travelling on foot. It is made out of bush poles and plant fibre cordage. Australian Survival and Preppers..: Uses For Urine. Australian Survival and Preppers..: Uses For Wood Ashes. 18th Century Wilderness Living; Pack Items. When living in the wilderness you need to be able to look after yourself, your tools & your equipment. Even if your wife/husband is with you, you still need to be self-reliant. In this way, should you become separated for any reason, then you are both able to survive. The awl is used for repairing and making leather and tree bark items, such as moccasins, pouches, belts knife sheaths, containers, and pack straps. It can also function as a tool to remove large splinters. In the image above you can see a wooden sheath bound in waxed linen thread. This wooden sheath is made to fit over the metal shaft of the awl. The top example is one that I made myself, which I now use at home. The lower one is an original awl which once belonged to my Father. It is this lower awl with the wooden sheath that I carry in my pack at all times. Damage to clothing and equipment is bound to happen sooner or later when travelling in the wilderness; tears in clothing lets in the cold air in winter and the mossies during summer. A tear in your oilcloth will let in the rain. If such damage is left unrepaired, then it is inevitable that these tears will increase in size over time, so it is important to repair them as soon as possible. To this end most woodsrunners carry some for of sewing equipment. This is my “Housewife”, it contains; needles, two sizes of linen thread, spare buttons, rolls of sinew, and beeswax for waxing the thread and sealing any tears in my oilcloth. I was once operated on without any rum to dull my brain and only a piece of rolled rag to place between my teeth. I was younger then and yet was so disabled at this time that I fear in my now later years I might not fare so well. So it is then that I determined to carry with me some form of medical equipment and a bottle of rum. The rum bottle I have secured in an old leather drawstring pouch. My medical provisions though very little do hopefully serve my needs in the case of injury or snake bite. A blade is only as good as it is kept, and a blunt blade is of little use at all. So I carry a small metal file and a whet stone. Creek stones can be used, I used one for some time myself, but as soon as I was able I secured a proper whet stone. These two items are well worth the extra weight, though in truth they both weigh little, but every small item combined with other small items does add weight to your pack. Keeping reasonably clean is important to me, even though I may go for long periods of time without washing anything but my hands and face. Nothing is more refreshing to me than washing in a cold forest stream first thing in the morning, & after a long walk dipping my feet in cool water and then drying by the fire. I have at times washed using wood ashes from my fire, and at other times sand, but nothing compares to using soap. I carry a piece of soap and a broken piece of an ivory comb in a cloth bag. I deduce from this journal record that these men had no dry kindling, or, they had run out of tinder. For one man to run out of tinder I might expect, but for two or more men to neglect to collect more tinder seems unlikely. So I suspect the problem was no dry kindling being available given the weather conditions. A smart man or woman in this period under these sorts of living conditions is unlikely to make this same mistake twice. So I think it is safe to assume that at least some people would have made provision for carrying dry kindling with them in future and certainly to make sure their tinderbox was well stocked with prepared tinder. My close friend the late Arthur W. Baker and I shared many adventures over the years, travelling on the Great Lakes in winter by boat and canoe, being caught in sudden storms before we could reach shelter we have huddled under canvas and spent some cold nights using our boat as a shelter turned on its side. We never failed to make fire even under the most arduous weather conditions because we both learnt early on how important it was to be well prepared when travelling in the bush and never to take anything for granted. A week or more of wet weather can reduce your tinder and dry kindling supplies to nought. This bag was Arthur’s kindling bag. On short trips he may not bother to carry this bag with him, but on longer trips and certainly when he was travelling by water, he always carried this bag containing dry kindling. It weighs very little when packed, but is a little bulky, but well worth the effort of carrying it along. Recently I did find myself in the position of having run low on supplies of kindling which I carry in the bottom of my fire-bag. A week of wet weather meant everything was at least damp if not totally wet, so I had to resort to using a lot of tinder and fanning the fire with my hat to get it hot enough to flame. Had I been carrying this kindling bag it would have made my fire lighting much easier. Maybe Mr Hearn did not learn the lesson the first time: “…rain began hammering down so heavily that, one hundred miles from the nearest trees, and with nothing available but moss, nobody could start a fire.” Samuel Hearne, 1770. There is also an Indian kindling bag in the United States National Museum. Figs. 19-21.—Fire-making set and extra hearth. Cat. No. 10258, TJ.S.N.M. Frobisher Bat. Collected by C. F. Hall. 20, Moss in a leathern case. Cat. No. 10191, U.S.N.M. Tools for shelter construction and food production were/are important if you are moving into the wilderness to settle. The more people there are, or the more stock animals there are the more weight you can carry. But let us assume to start off with that your family/group is travelling on foot with only chooks for stock. Let us take a look at the tools that are available, tools that you may need. Some of these tools you may decide to carry complete with handles so they can double as weapons upon the trail. Others you may wish to remove the handles and just carry the tool heads in your pack. The handles can be made later. The pruning saw has changed little since the 18th century, except to give this slight curve to the blade. These small saws cut very well. I made this auger and gimlet from two old bits with no handles. These were used for shelter construction and the making of other wooden items. A pick is a very useful tool for digging or just breaking up the soil. A hoe is useful for digging rows and weeding. The mattock is another excellent digging tool. If you can't dig a hole for a post, then you can dig a trench instead. A sickle is used for cropping and for collecting reeds for thatch roofing. This tool is light and very useful. The handle on this one is a corn cob. A larger auger for larger construction work where you need to join timbers with wooden pegs. The wooden handle is easily made in the bush. This half-axe is much easier to carry than a full size felling axe and I have often carried it tied to my blanket roll. Two larger tools are the adze and the felling axe. Useful tools if you have the people to carry them. You can manage without a shovel, you can even fashion one out of wood. But if you can put a short handle on a small shovel head it would come in useful for digging post holes. You could even carry just the head and put a long handle on it when you get to where you are going. If you only have a large shovel head, you can cut it down with a cold chisel. Gun Tools & Parts You May Need. Leather pouch, turn screw, container of grease for waterproofing the pan, screw, pin punch, spare leather to hold the flint, and two spare flints. Pouches and-mainspring vise, spare lock screws, spare set of lock springs, spare hammer, and a wad punch. On the shot pouch strap: vent quill, powder measure, ball board, pricker, and pan brush. Container of leather wads (Patch material was not used in smoothbores). Forged worm on the reverse end of the ramrod. Powder Horn (there were no priming horns in the 18th century). Leather flask of bird shot. Leather bag of round ball. Leather bag of swan shot. Leather gunpowder bag for carrying extra gunpowder. Images from my Wigwam Camp in The Forest. Inside fireplace in front of bed. Bed of rolled bark. This is the inner bark I removed from the bush poles. I can also use this bark to make cordage. Trader for Ausie Living Historians & Historical Trekkers. Just a reminder regarding my friend Mick's "Mopoke's Stock and Trade in Victoria Australia. If Mick does not have what you want in stock, just ask him if he can get it in for you. Now I know for a fact that there are followers of this blog that are “survivalists” and or “preppers”. 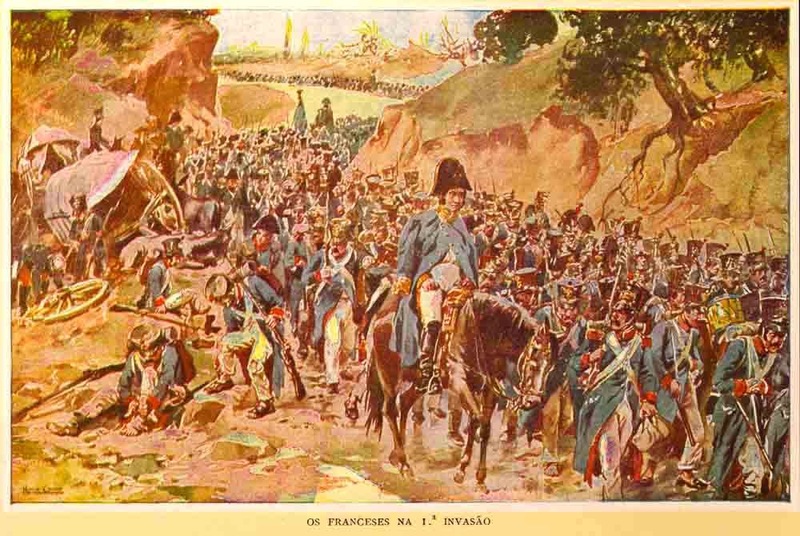 But this is an 18th century blog, so although I consider myself to be a survivalist also, it is not a 21st century issue that I can write about on this blog. However, you have obviously already worked out the link here, so I will continue to let you draw your own comparisons and reading between the lines. 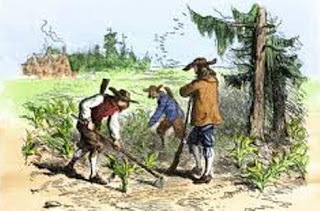 From the word go in the 18th century new settlers travelling to the new world found themselves in a survival situation; not only did they have to try and find tools and equipment that they would need in the new country, but they had to survive the trip to the New World. Self-defence and defence of their property was an issue, and if anyone became so sick that they could not look after themselves, there was a good chance that they would be thrown overboard to drown. "I noticed particularly, one family of about 12 in number. The man carried an axe and a gun on his shoulders. The Wife, the rim of a spinning wheel in one hand, and a loaf of bread in the other. Several little boys and girls, each with a bundle, according to their size Two poor horses, each heavily loaded with some poor necessities. On the top of the baggage of one, was an infant rocked to sleep in a kind of wicker cage, lashed securely to the horse. A cow formed one of the company ,and she was destined to bear her proportion of service - a bed cord was wound around her horns and a bag of meal on her back. They were not only patient, but cheerful and pleased with themselves with the expectation of seeing happy days beyond the mountains"
Diary of Presbyterian Rev. David McClure. 18th century. Once in the New World they may have to trade for or purchase other needed items for their survival. 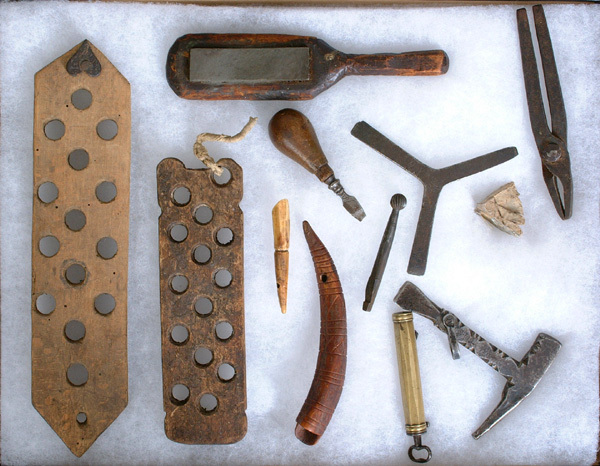 These tools and equipment were very basic but very necessary for their protection and survival beyond civilization. 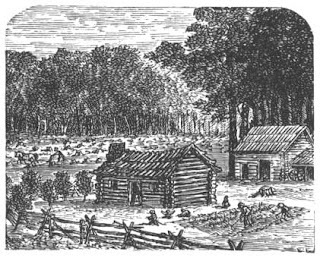 Not only were there dangers on the trail to their homestead, but there was dangers when they reached their destination. Wild animals were the least of their worries compared to the woodland Indians. These natives saw these settlers as invaders of their land, which they were! So they would kill, take prisoners and burn the settler’s homes if they could. The only way the settlers could avoid such a threat was through continuous vigilance and being armed at all times, even when working the land. 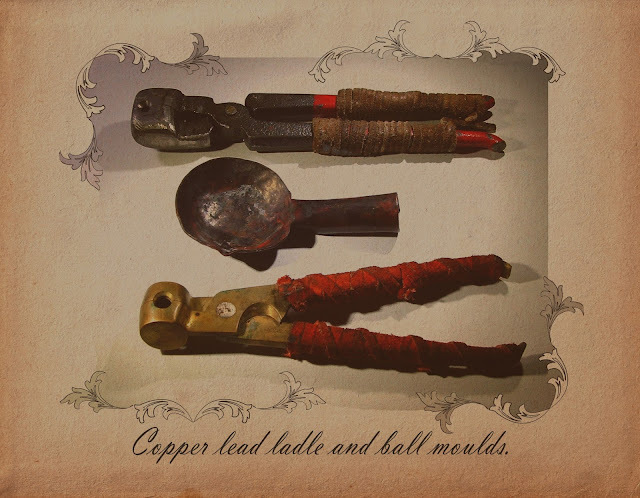 Women and children were not only trained in the use of flintlock guns, but they also knew how to mould round ball from moulten lead. The flintlock gun was particularly suited to use in a wilderness situation, far more so than the later percussion guns. The flintlock only required a sharp piece of flint or similar hard rock for the ignition, and this could often be found in the forests and fields. 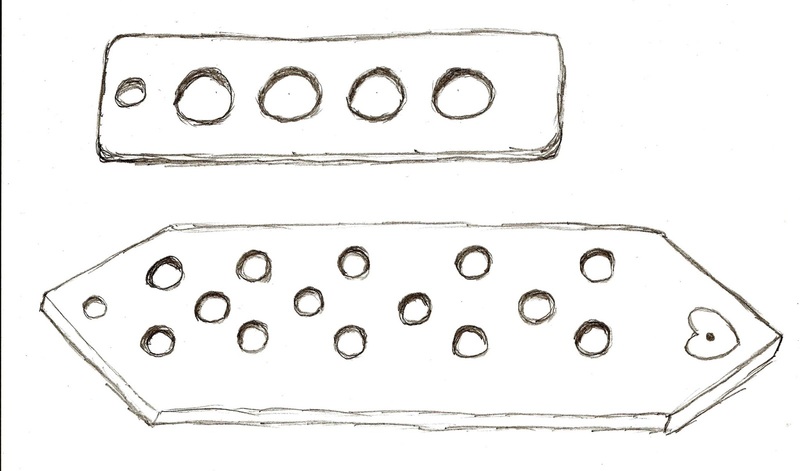 The spent lead could be retrieved from shot game and remoulded into ball or shot for reuse, so gunpowder could be traded for or purchased in larger quantities instead of continuously purchasing lead. This was particularly important when travelling on foot over long distances, as there was less weight in lead to carry. This also meant that the ammunition lasted much longer. John Joseph Henry in "An Accurate and Interesting Account of the Hardships and Sufferings of That Band of Heroes, Who Traversed Thru The Wilderness in the Campaign Against Quebec in 1775 "
Knives were very basic items; individuals often owned and carried more than one knife. Butcher knives were a trade item and the favourite of woodsmen and Indians alike. This light but sturdy and often quite large blade was well suited to skinning and butchering game, as well as being a good tool for self-defence. Often a larger butcher knife would be carried in a sheath under the waist belt, plus a smaller version could be carried as a legging knife and a clasp knife carried in a waistcoat pocket. These knives combined with a trade axe, also typically carried under the waist belt along with a flintlock gun and perhaps a matching caliber flintlock pistol were all the arms a woodsman or settler may carry for his/her defence and sustenance. Foods were fairly plain, consisting typically of corn grown in their own fields plus perhaps beans and pumpkins. These were also known as the three sisters by the Indians, as these three foods were often grown together. Meat was often dried, which was the easiest way to preserve it without the use of salt. Corn or wheat flour for baking bread plus fresh meat hunted in the woods could sustain a family for a very long time. Excess farm produce could be traded for lead, gunpowder, tools, cloth, salt, needles and thread and perhaps some rum or coffee. “the squashes or pumpkins are cut in slices, drawn upon a thread , and dried. They keep all year long, and are then boiled or stewed”. Peter Kalm 1749. Fires were easily lit using a tinderbox. The term tinderbox not only refers to the actual box itself, but also encompasses the flint, steel & tinder that this box contained. In the city people were used to using charred tow rag or German tinder bought from street criers or from the apothecary shop. But in the wilderness there was a variety of wild plants that could be used to produce tinder, punk wood probably being the most common but also some species of bracket fungus and the fluffy heads of the cattail plant. 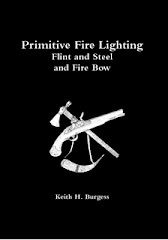 This was a sustainable fire lighting method that was always available to the woodsman, settler and Indian alike, plus the lock of the flintlock gun could be used to make fire without the use of gunpowder. Apart from all the basic equipment carried by the new settler into the wilderness the other needed items were tools to work the land and perhaps a spinning wheel. Some farming tools may have been carried with handles and stails attached so they could also be used as weapons for defence. Other tools such as picks and mattocks may have consisted of the heads only; the handles to be made and fitted when they reached their wilderness destination. This made them easier to carry in a sack or a bag. Water was a much needed item, and probably the heaviest item these settlers had to carry. It makes sense then that where they could, they would have followed a water course; a river or creek, and to actually settle close to that water supply. Some historians claim that most of the settlers travel was in fact by water, but period accounts of settler travel do not bare this out. Water courses were in some instances too low to accommodate a canoe, let alone a loaded boat. But I daresay where the waters were deep enough, this mode of travel was in deed an option. So let us recap the situation of the settler in the New World. Having survived the trip to this strange land they were then faced with arduous travel over unknown trails through dark forests in search of land to settle. If they survived this journey they then had to settle the land by clearing trees, building a shelter for their accommodation whilst they worked on constructing a larger and more secure cabin. The cleared land had to be cultivated and planted, as did the garden in which they would grow some vegetables and herbs and perhaps some fruit trees. 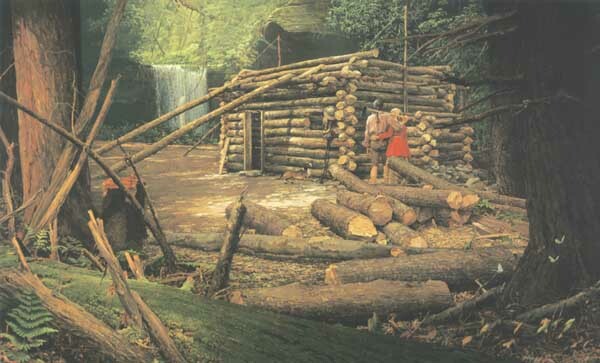 Having built the cabin their chances of surviving were increased as this structure gave them much more security than their earlier primitive shelter. With a bar on the heavy timber door and shutters on the windows, the cabin was a veritable fort compared to the makeshift shelter. From inside this cabin they could defend themselves against Indian war parties. Only two things could threaten their security, their vulnerability when working outside, and fire. Wise settlers carried their arms at all times, even when working in the fields, and water was always brought into the cabin early each morning. Even so the whole family had to remain vigilant at all times. A good look round surveying the area around the cabin was paramount before leaving the security of these four walls to perform any chore, especially early in the morning. The children too had their chores, fetching water, collecting firewood, tending and feeding any livestock, and perhaps checking a small local trap line. Cleaning chores were usually handled by the women and girls of the family, the boys and men worked the fields and hunted for meat. Sometimes the men were more hunter than farmer; such was the case with Daniel Boone. Whilst Boone was away hunting for deer skins, his wife and children run the farm. In the case of the farmer/hunter, the men do most of the farming, but occasionally hunt for meat for the table. Whilst the men are away, the women and children must be especially vigilant for any sign of danger from Indians or white renegades. The men too are in constant danger from Indian attack whilst hunting in the forest. This then is the life of the settler, ever on their guard day and night. Was there time for fun and leisure? Certainly there must have been. After a hard days work when they were relatively safe inside with the door and the shutters barred, especially in winter around a warm fire when the days were so short. Story telling was a great event for adults and children alike; a good time for carving spoons or perhaps shaving an arrow shaft, or making a snare or reading a book. Living in the wilderness had its compensations for these new settlers. They came searching for freedom, for a place to call their own. Looking back we can see that their occupation of this new land was entirely wrong, it was already home to the native peoples. But then again can we blame them for wanting to leave their impoverished life back in the Old Country in search of freedom in the New? Traps and Trapping. The Brass Wire Snare. The Trap Line. Setting a Rabbit Snare. Please Note: Due to the introduction of steel wire snares with locks, the government in all its lack of wisdom has declared neck hold snares illegal in NSW. 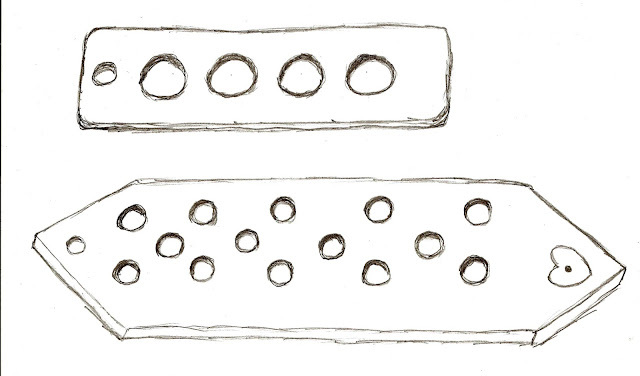 Sketches I did of two bullet boards that claimed to be 18th century. 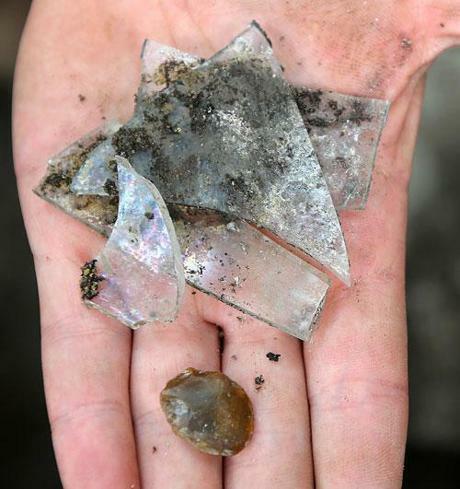 These are said to be dated to the American Revolution, but of course they could be earlier. Thoughts on the so-called Patch Knife. I have often wondered if there ever was such a knife as the Patch Knife in the 18th century. I carry three knives for practicle reasons, the hunting knife at my belt, the legging knife in my right legging, and a clasp knife in my waistcoat pocket. I would not want to carry a fourth knife, and I have always used my ready to hand hunting knife for cutting patch material. 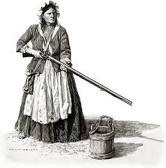 Having said that, I have not carried a flintlock rifle for years, and only use my fusil. 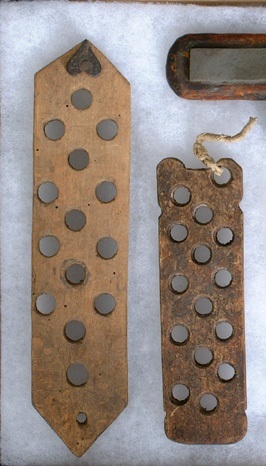 Patch material was not used with smoothbores in the 18th century, in fact even early rifles did not use patch material. Some people suggest that the clasp knife was used to cut the patch material, but to my mind the whole process of getting this knife out, then opening the blade, cutting the material, closing the blade and putting it away again just simply takes too long when taking a second shot or more. I welcome any constructive comments or information on this subject. 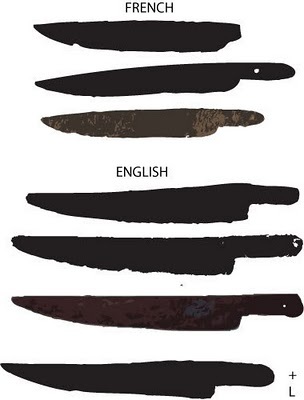 Trade butcher knives commonly used as hunting knives in the 18th century. A more up-market hunting knife (Metmuseum).